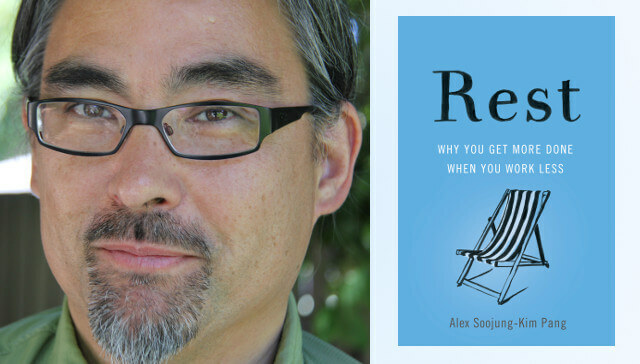 Alex Soojung-Kim Pang is the author of Rest: Why You Get More Done When You Work Less. Drawing on history, neuroscience, and psychology, “Rest” argues that leisure and mind-wandering are essential components to creative lives, and that many of history’s most creative and prolific people crafted daily routines that allowed some of their best insights and ideas to emerge during their leisure hours. Alex founded The Restful Company to help people and organizations apply these insights. He has a Ph.D. in the history and sociology of science from the University of Pennsylvania, and is a visiting scholar at Stanford University. 1MFWF: Your book is called “Rest,” but in fact, it’s a book about work–or rather, about the integral relationship between the two. Isn’t rest just the opposite of work? Alex: Rest is work’s partner, not its opposite. Each supports the other: work creates the means for rest, while rest gives us the physical and creative energy to do good work. Further, forms of rest that most effectively recharge our batteries aren’t passive, but active: exercise, serious hobbies, and spiritually or morally rewarding activities are actually better for us than binge-watching that show that everyone’s talking about. 1MFWF: Our current era feels uniquely frenetic. How can examples of successful people from the past like Darwin and Dickens, who worked only a few hours a day, be relevant to modern circumstances? Alex: The Victorians are often cast as living on the other side of a great historical divide, but their times look a lot like ours, and the challenges they faced in their work lives were similar. The Victorian era saw the rise of global trade and communication networks; huge corporate conglomerates; the growth of increasingly multicultural metropolises; and new forms of work whose rhythms weren’t dictated by the day and the seasons, but by the speed of steam engines and telegraph lines. The Victorians were even the first to diagnose overwork and burnout as medical problems. If their lives were more like ours, maybe their solutions to the problems of overwork are more accessible than we think. Deliberate rest doesn’t only involve short hours, though people who have lots of control over their time and spend it well (like writers, scientific researchers, and the like) tend to converge on schedules organized around intensive periods of work and plenty of deliberate rest. People who have less control over their schedules (like ER doctors, teachers, or police) avoid burnout when they can maintain really clear work-life boundaries, when they have serious hobbies that provide a mental break from work, and when they take vacations. Finally, it worth noting that people like Darwin and Dickens are like Serena Williams or Steve Jobs: they’re world-class practitioners of deliberate rest. Even if we can’t do exactly what they did, we can still learn from them. 1MFWF: Four hours on a task a day—often weighted towards the early morning—seems to be a sweet spot for many creative and productive people. What schedule did you follow when writing your book? Alex: I was amazed at how many prolific people get up early. And I did my most serious writing in the early morning, starting around 5 AM; I’d go on a long walk after a couple hours, then come back and have a second round; hit my word quota by lunch; and spend the rest of the day reading, maybe dealing with my publisher or PR folks, and but generally doing more low-intensity stuff (including a nap). In the evening I’d set up things for the next morning, so when I got up I didn’t have to spend any time or mental energy deciding what to have for breakfast or what chapter to work on: I just rolled out of bed, got coffee, and immediately got to work. 1MFWF: Many of the leaders you cite as models of effective balancing of rest and work seem quite exceptional: mathematicians who are also world-class rock climbers, Rhodes Scholars who played in the NFL, Olympians who are neuroscientists and inventors. Having to excel in not just one but two spheres at the same time in order to be successful feels like rather a lot of pressure—and not very “restful” at all! Is that the wrong way to look at it? Alex: Here’s the key: people who are world-class scientists or writers AND also serious athletes or artists hit a very specific kind of balance. Those hobbies are a BREAK from their working lives; but they also provide some of the SAME satisfactions as their work, which makes them a compelling diversion. For scientists, for example, rock-climbing requires problem-solving and patience, but it’s also intensely physical, gets you outdoors, and requires such complete concentration you can’t think about your research. For people who are naturally obsessive, that’s a valuable thing. 1MFWF: If rest is required for optimal performance at work, how might companies rethink structuring the workday? Alex: In general, they’re recognizing a couple things. First, strong work-life boundaries are actually more beneficial over the long run than that version of flexibility that ends up allowing work to seep into every hour of you day. Second, there’s a lot of inefficiency in the modern office and work day, and just by eliminating things like long meetings and endless email chains, you can make work more effective and people more productive. Third, they’re recognizing that people have creative peaks during the day, and are structuring the work day to protect our most productive hours.